Burj Khalifa known as Burj Dubai prior to its inauguration, is a skyscraper in Dubai, United Arab Emirates, and the tallest man-made structure ever built, at 828 m (2,717 ft). Construction began on 21 September 2004, with the exterior of the structure completed on 1 October 2009. The building officially opened on 4 January 2010.The building is part of the 2 km(490-acre) flagship development called Downtown Burj Khalifa at the "First Interchange" along Sheikh Zayed Road, near Dubai's main business district. The tower's architecture and engineering were performed by Skidmore, Owings, and Merrill of Chicago. Adrian Smith, who started his own firm in 2006, was the chief architect, and Bill Baker was the chief structural engineer for the project. The primary contractor was Samsung C&T of South Korea, who also built the Taipei 101 and Petronas Twin Towers. Major subcontractors included Belgian group Besix and Arabtec from the UAE. Turner Construction Company was chosen as the construction project manager. Under UAE law, the Contractor and the Engineer of Record, Hyder Consulting, is jointly and severally liable for the performance of Burj Khalifa. The total cost for the Burj Khalifa project was about US$1.5 billion; and for the entire new "Downtown Dubai", US$20 billion. 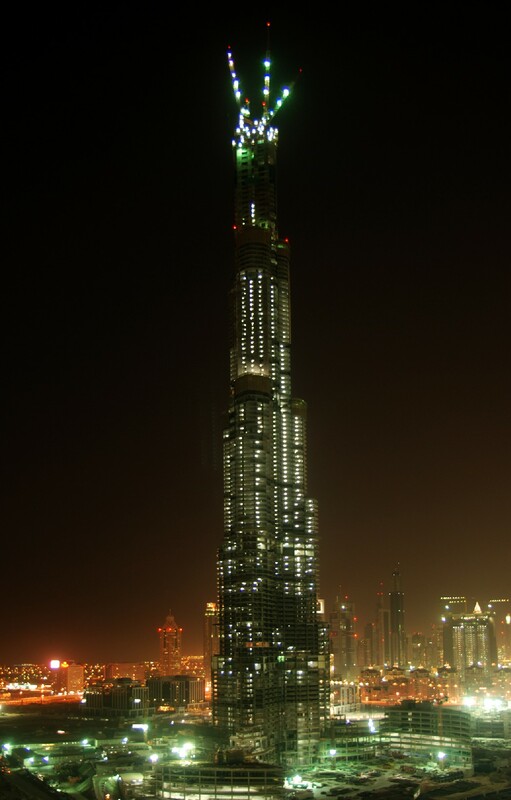 Mohamed Ali Alabbar, the Chairman of Emaar Properties, speaking at the Council on Tall Buildings and Urban Habitat 8th World Congress, said in March 2009 that the price of office space at Burj Khalifa had reached US$4,000 per sq ft (over US$43,000 per m2) and that the Armani Residences, also in Burj Khalifa, were selling for US$3,500 per sq ft (over US$37,500 per m2). The project's completion coincided with a worldwide economic slump and overbuilding, and it has been described as "the latest ... in string of monuments to architectural vacancy. "With Dubai itself mired in a deep financial crisis that forced it to seek repeated billion-dollar bailouts from its oil-rich neighbor Abu Dhabi, the opening ceremony and surprise renaming of the tower to Burj Khalifa, after UAE President Khalifa bin Zayed Al Nahyan, has been viewed by observers as an "attempt to boost confidence in Dubai by showing who is backing Dubai.